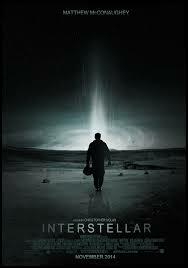 Strange and creative, the way all Christopher Nolan movies are, this movie is also a little too long and tiring. This is Christopher Nolan’s most ambitious and most complicated movie. Nolan is obviously a mastermind filmmaker on a high level, and he is quite possibly the best working in sci-fi genre today, but he doesn’t have very good restraint or self-control. It’s his absolute biggest flaw. The result of that here, is that we get a very interesting movie that is visually spectacular, but just way too long. The first half of the film is great, and so is a lot of the second half, but the more it goes on, the more complex it gets until it slowly starts to lose us. Towards the end of the film, we begin to feel a litle like we did in that Matrix Reloaded scene between Keanu Reeves and the architect in the all white room. There’s a lot going on here, and it all seems pretty cool, but understanding exactly what it is or means is a whole other ballpark. And boy is there a chunk of stuff that could have been cut. Interstellar is a fascinating movie. For a Christopher Nolan film, you can’t really expect anything less. He is the greatest sci-fi mastermind director working today. sure J.J. Abrhams makes smart and elaborate films in this genre too, but with Nolan, it’s all business and very little pop campiness. JJ is more about fun. Nolan is more about smart. If it doesn’t make you scratch your head and try to figure out the puzzle, then it’s probably not a Nolan film. Consider that this guy’s simplest movies were his first three. There was the black and white movie, The Following, then the backwards storytelling film Memento, and finally the serial killer in Alaska movie, Insomnia. All great films, all very smart. The fact that those were his simplest films should give you an idea of what the guy had coming down the pipe. Nolan started making Batman movies, and he tackled the superhero genre like nobody else. There might never be a filmmaker who is so suited to make dark and intelligent superhero movies, as Nolan was. That’s not to say that all of his Batman films were good, (I was not a fan of The Dark Knight Rises,) but they certainly all had real presence, intelligence, and scares. And then, of course, were some of his movies that bended reality and expanded the genre, The Prestige and Inception. Both excellent movies and both unbelievably crafty. 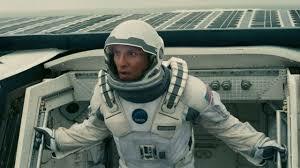 And that brings us to Interstellar, which just might be Nolan’s most elaborate and complicated film to date. Whereas Inception took you in between dreams, and through a dream within a dream multi-layered world, Interstellar tampers with planets, dimensions, and time. It’s like Nolan said that Dreams on earth wasn’t enough. And going to space for a movie wasn’t enough either. He needed a movie that tackled the changing universe, worm holes, black holes, and ways of suspending time. It’s a lot to take in. At the start of the movie, we are with Cooper (Matthew Mcconaughey, hot off from his oscar win for Dallas Buyer’s Club and his hit series True Detective,) and his two kids. They live on a farm with the kids’ grandfather, (the father of Cooper’s wife, who passed away some years earlier), played by John Lithgow. Cooper used to be an engineer for NASA before he took up farming. It is now the future, and there is a major problem on earth that is now threatening the future of human kind. The problem is that the sun has been blotted out and dirt and dust are everywhere. The air is terrible for breathing, and mankind doesn’t know what to do. Cooper goes to see the teachers of his children, and we learn a little bit about both the kids as well as how Cooper responds to authority and to notions he does not agree with. At the school, the administrators try to make the argument that the moon landings were fake. Cooper isn’t interested in listening to any of it. Especially after they tell him that his son won’t be going to college and is destined to become a farmer, just like him. One day a signal gets picked up at Cooper’s house and he gets into his truck and follows the signal. It leads him to the underground, secret headquarters of NASA. These are people who used to work with Cooper, and they want him back. Even getting to this point takes a little too long, with Cooper first following a drone around, only to show up to the school with the drone stuffed into the back of his truck. None of that really leads to the signal that led to NASA, and so it’s all just extra stuff that makes the movie take longer. Pretty soon, Cooper has signed onto a space mission to go up into the stars and look for another planet or world where mankind can survive. For the most part, the scenes that made up the first half of the film, and got us to this point, were all pretty good. Certainly the time spent discussing life on earth in its current situation, and also discussing Cooper’s children, was necessary. But the movie is three hours long, and it’s at about the halfway point that we start to feel it. The second half is there the movie goes from gripping to a little dull. Now, it is also, in some ways the most exciting parts of the film. After all, the second half is where Cooper starts exploring other planets and worlds. It starts out pretty cool on a planet that seems to all be one big ocean with massive tidal waves. The best scene in the movie comes when the rectangular robot the crew has on board goes sprinting out into the water, doing all kinds of flips and spins, in order to save one of the crew members. From there, we go to an ice cold, snow covered planet, and here’s where the complications really begin, with character’s who have agendas and surprises that come out when you least expect them. By the end of the movie, we have traveled through black holes and worm holes, hung around in space-time continuums, and found the work of some fifth-dimension beings who may or may not be humans of the future. It gets way out of hand. Especially when Cooper get stuck in this sort of tunnel that connects him to other times and worlds. The section that really should have been cut the most was the one where they left the frozen planet and now had to spend twenty minutes or so dealing with technical problems on their space craft. This movie did not have to be everything all at once, and here in this sequence, it really did not have to become Apollo 13. Other than being too long, and too packed with elaborate ideas, the movie is quite good. The music is fantastic, and the challenge of figuring out the plot turns out to be fun. This is definitely a thinker’s movie, as are all of Nolan’s films, but it needed to be tighter in order to hold our attention and make us care. A three hour film is one that shows no restraint at all. it doesn’t care if the audience is confused or tired or uninterested. That’s what we get here, by the end. Always interesting, but way too long and too complex.